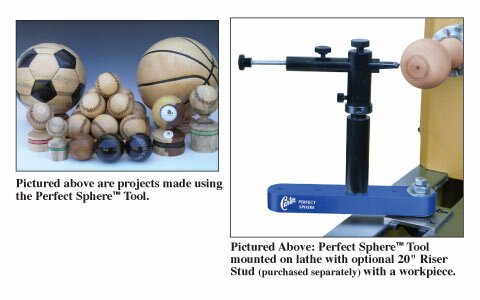 This patent pending Perfect Sphere™ Tool is a sphere and concave turning system adaptable to most lathes on the market. The carbide cutter provided with each system provides long edge life and a smooth finish. The Perfect Sphere Tool comes with an adjustable mounting base that accommodates most lathe bed widths, Cutter head, Hunter #4 (1/2") carbide cutter with cutter holder. The Carter M-Chuck is available below for holding the sphere between centers to turn off the nub left after initial turning on the Perfect Sphere Tool. The M-Chuck is also used for doing the final sanding and finishing of the workpiece. A Riser Post to fit lathe swings from 10" to 25" needs to be purchased separately below.